This project contributes to the economic and social empowerment of 2000 small-scale coffee producers in the departments of Antioquia and Chocó, Colombia. Through a set of technology tools, field agents and financial services, the project seeks to improve quality, productivity and sustainability in the coffee crops owned by Smallholder Farmers (SHF's). By developing individual Farm Management and Investment Plans, each farmer will be implementing commitments conducive to improving and adopting Good Agricultural Practices (GAP's) in their farms. The project will also be testing the Alternative Risk Evaluation Tool (ARET), to unlock access to credit opportunities through a different credit analysis approach, based on farming practices rather than the usual financial requirements, such as collateral. Delos Andes Cooperative, Starbucks, Coex, and Grameen Foundation. The project benefits 2000 small-scale growers (1,019 women and the rest men), who own farms between 0.1 and 5 hectares of land and who belong to Delos Andes Cooperative. The project will also benefit the farmers’ families, reaching more than 6200 indirect beneficiaries. 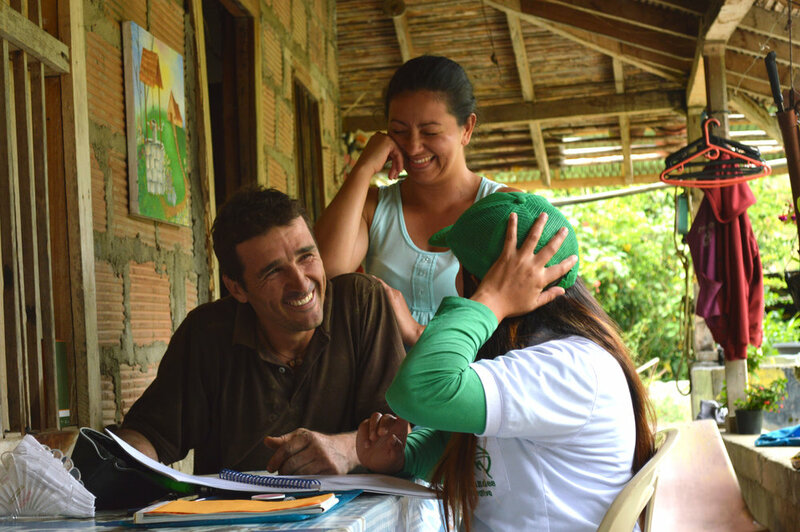 The project takes place in the regions of Antioquia and Chocó in Colombia in the Municipalities of: Andes, Jardín, Betania, Hispania, Ciudad Bolívar and Carmen de Atrato.